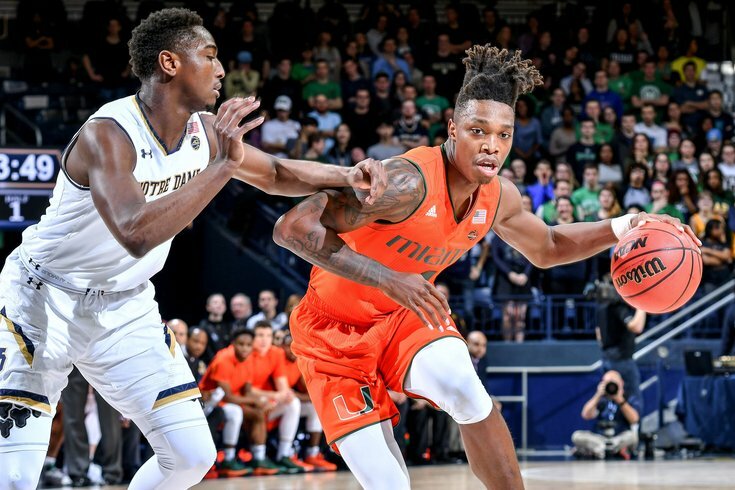 Miami Hurricanes guard Lonnie Walker IV could be an option for the Sixers in June's NBA Draft. Anybody who stuck with the Sixers through the lean years over the last half decade — there were dozens of you, dozens! — became intimately familiar with the NBA Draft process. The ebbs and flows for the top prospects, the surprise risers who come out of nowhere, and the regret when that player you fell in love with went to a team you hate, that was all a part of what made following the NBA club tolerable. A promise of youth on the horizon was exciting. Things have changed a whole lot since last season, thanks to the youth acquired in the draft finally stepping up and putting the franchise back on the map. Joel Embiid and Ben Simmons have been everything the Sixers dreamed they could be, and with assistance from the likes of Dario Saric and Robert Covington, a movement is building. Philadelphia is pushing themselves out of lottery territory with swiftness. If you're not a college hoops head otherwise, that changes your watching habits. Fans of the sport won't turn down watching a matchup of high-caliber prospects, but they aren't watching a center like DeAndre Ayton and dreaming of him playing for the Sixers. Barring a miraculous jump for the Lakers pick in the draft lottery, the Sixers will likely pick just outside the top-10 at the earliest. With the NBA team far more compelling these days, fans probably aren't hunting down random Big 12 games or European footage to find the team's next eighth man. And that's why I'm here to help. There are a ton of games to focus on over the next few days, and for those of you without a rooting interest in a particular college team, you can get a glance of some players who may get consideration when the Sixers use one of their picks this June (assuming they don't trade one or both, of course). So let's start with the ledger for Thursday, which has a player that should be near the top of every Sixers wishlist alongside some other interesting names. We'll go through them in chronological order, and you can choose how much of your day you want to waste spend watching March Madness accordingly. If you did nothing more than take a quick glance at Walker's averages for the year, you'd have to wonder why the Sixers should be interested in him at all. The Reading, PA native is averaging just 11.5 points per game for Miami this season on 41.5 percent shooting from the field, and his three-point numbers (34.6 percent on five attempts per) are nothing special for a college freshman. Interest in Walker stems from a couple simple factors: prospect pedigree and improved performance in conference play. The former is a little easier to pin down, with Walker exiting high school as a five-star recruit with a reputation as a bucket getter. He broke the scoring record at Reading High School set by longtime NBA player Donyell Marshall and the McDonald's All American led the program to their first state championship in their 117-year existence. Things went off the rails for Walker last summer thanks to a torn meniscus suffered during a practice, which helps explain the slow start to his collegiate career. But as he got his legs under him over the course of the season, Walker finally started to show why he was so well-regarded coming out of high school. If you couldn't tell from their post-deadline acquisitions, the Sixers badly need shooting and scoring off the bench. The flashes are there for Walker even if the consistency isn't, and he has shown an impressive variety of shotmaking for a freshman. Walker pairs that ability to shoot off the catch and the dribble with good athleticism and a prototype frame for a shooting guard. Because the numbers aren't quite there, his potential as a lottery pick relies a lot on "the look," and scouts believing he will put it all together over time. But the road to glory for a select group of wing scorers is paved with players who flash against lower competition and never get there. You're a lot more likely to draft the next Ben McLemore or O.J. Mayo than you are the next great shooting guard. That said, there's a dearth of high-end talent at guard and on the wing in this year's draft, and Walker will find himself in consideration in the top-20 as a result. You might as well see if he offers a set of skills you're interested in. The problems with Bates-Diop as an NBA prospect are pretty glaring if you take the time to look. History doesn't smile kindly at players who suddenly take a big leap forward late in their college careers, with their progress primarily a product of playing against younger and much smaller competition. There are exceptions to every rule, but always beware of a late shooting improvement. Bates-Diop's timeline is muddied because of a stress fracture he suffered during his junior season, and that shouldn't dispel the progress he's made upon returning this year. He's the driving force behind Ohio State's tournament appearance, combining scoring (19.4 PPG) with rebounding (8.8 RPG) en route to a Big Ten Player of the Year award. You don't have to squint all that hard to see a useful NBA player because combo forwards who can shoot will always have some value. The question is whether his red flags make him more untenable from Philadelphia's perspective than they would on a different team. Bates-Diop is more of a 3/4 hybrid than a pure wing, and that's an area where the Sixers are well covered. Dario Saric has emerged in a big way during his second NBA season, and when you factor in Simmons needing time there with Covington able to slide up to the four to play small ball, there's not a pressing need for someone in this mold. For a guy who runs the show, Bates-Diop also has a dismal record as a playmaker at the college level, and underlying numbers that suggest he won't be able to reliably create his own shot at the next level. Over 91 percent of his three-point makes were assisted this season, per Hoop-Math, which suggests he'll struggle to shoot off the dribble at the NBA level. His ability to make tough shots papers over the flaws, and if his motor was always revved up he would probably look even better. Consider me a skeptic, but do yourself a favor and give him a look anyway. Based on the buzz in scouting circles, Bridges is moderately unlikely to be left on the board when the Sixers make their first selection in June. He has solidified himself as a top-10 candidate with another year of progress under Wildcats coach Jay Wright, and he fits the mold that every NBA team is looking for on the wing these days. But everyone deserves to dream a little bit, so let's pretend Bridges drops into Sixers territory. He would be inch-perfect for what they need out of their young guys moving forward, helping to solidify the team's weakness on the wing long-term. At 6'7" with a 7' wingspan, Bridges has prototypical size and athleticism for a modern NBA wing. The one wart in Bridges' game is his lack of an advanced handle, which is really one of the only things holding him back in the mind of talent evaluators. He has offset that with remarkable progress as a three-point shooter during his tenure at Villanova. Bridges shot under 30 percent from three on low volume in his freshman year, a mark that rose to 39.3 percent his sophomore year and 43.3 percent on six attempts per game this season. With multiple years of shooting success at the three-point line and free-throw line, Bridges should be taken seriously as a three-and-D prospect of the highest caliber. Teams traditionally passed over players in this mold to pursue players with more shot creation equity, but the NBA's emphasis on small ball has changed that mindset. Playing on a Sixers team with Ben Simmons, Joel Embiid, Markelle Fultz, and possibly a star free agent, Bridges' lack of shake would be minimized, and he could focus his energy on finishing and shot-making on offense. His percentages have climbed while he has added a variety of shot types to his game, and his high-release point will make him a weapon coming off screens. If you needed an excuse to watch one of the local teams in the tournament, this kid is it. If he chooses to declare after his freshman season, Smith will be one of the youngest players in the 2018 class, not turning 19 until early June. It'll be a tough decision for the Garland, TX native after a breakout year. Do you capitalize on the buzz after emerging as a relative unknown, or gamble that you can improve enough next season to climb higher now that you're a known entity? Smith is one of the more compelling watches in college basketball right now, if only because there's not really another player like him. He's a 6'5" combo guard with a 6'9" wingspan, and he's a pretty ridiculous athlete to boot. At least a couple times per game, he wades into the trees on the offensive end and snags a rebound, quickly bursting back toward the rim for second-chance points. That athleticism serves him well on the defensive end as well. He has the size, speed, and toughness to defend both guard spots, and his compete level has been consistently excellent. If he ends up getting drafted in the first round this season, this is the reason why. It's the offensive end of the floor that's currently a work in progress for Smith. His three-point percentage (41.9) is misleading because he has only attempted 31 shots from deep all year, and he has relied primarily on scoring around the basket. Over half of his shot attempts have come at the rim, which is a tough way to live for a guard in the NBA, and may end up forcing him into more of a wing role whenever he makes it to the next level. At this stage, he's not much of a threat to shoot. Smith can overcome this if his handle reaches the point where he can reliably draw fouls while attacking, but he's not there quite yet. A lot of insiders believe he'll come back to school for another season to iron out some of these kinks and solidify himself as a draft candidate in the class of 2019. Having youth on his side helps minimize the risk if he does return to school. Though he probably would have been a better fit for the Sixers' program when they were searching for unpolished diamonds during the rebuild, there's enough here to earn your attention. Knox has long been considered the best NBA prospect on this year's Kentucky team. He's big enough to post up small forwards, quick enough to get by power forwards, and his quick release at 6'9" makes him a good bet to score at the next level. When he has it going, Knox can do a little bit of everything on offense, from attacking closeouts to tearing down the floor in transition. In this way, he would work great as a compliment to Simmons and Embiid in Philadelphia. But there may be a better prospect on his own college team, it's just a matter of whether he makes more sense on the Sixers or not. Gilgeous-Alexander has been on an absolute rampage in recent weeks, and he was the catalyst behind Kentucky's surprise SEC Tournament win. While Knox often serves as the finisher in Kentucky's offense, it's SGA who creates many of the shots in the first place by putting a defender on his hip and finding the open man when the defense collapses. Though he arrived to Kentucky relatively unheralded compared to the usual freshman leader in Lexington, Gilgeous-Alexander has won the scouting community over with an impressive array of skills. On top of his playmaking abilities, he has emerged as one of the best finishers at his position in the country, using all sorts of unorthodox methods to score around the basket. He hits opponents with Euro steps, one-footed finishes, floaters, and does whatever it takes to duck and dive around shot blockers. Shooting remains a question mark, as Gilgeous-Alexander has a slow, somewhat mechanical release, which will hurt him more at the next level. He has only taken 53 attempts from deep this season, though his percentage there (39.6) alongside his mark at the free-throw line (81.4) offers hope for his potential to space the floor on an NBA team. Both players are worth keeping an eye on as long as Kentucky is in the tournament.